UT students, faculty, and staff, as well as members of the local community, are encouraged to pitch their business ideas at Vol Court, a semiannual pitch competition and speaker series run by the Anderson Center for Entrepreneurship and Innovation in UT’s Haslam College of Business. The series begins January 31. Winners may receive up to $1,500 in prize money and space in the UT Research Foundation Business Incubator as well as legal and accounting services. The series and competition are open to the public. There is no charge to participate in the event, and anyone interested in entrepreneurship is invited to attend. Designed to introduce participants to entrepreneurship, the series provides a starting point to help advance business ideas into reality. The spring 2018 series includes five interactive entrepreneurial speaker sessions with local entrepreneurs and UT faculty. New sessions include “Funding Continuum for Startups” and “The Art of Entrepreneurial Storytelling.” Participants will learn how funding sources change during the different stages of a growing business and how to effectively share information about a new business. The program culminates on March 7 in a pitch competition where attendees put what they’ve learned into practice. All pitch competition participants are eligible for cash prizes awarded to first-, second-, and third-place winners. Vol Court meets from 5:15 to 6:15 p.m. weekly from January 31 through March 7 in the Haslam Business Building, 1000 Volunteer Blvd. All meetings will be held in Room 104. Vol Court is made possible by donated funds and services from sponsors including PYA, Morehous Legal Group, 3 Roots Capital, the UT Research Foundation, and other local businesses. A time-saving surgical tool created by UT graduate student Lia Winter took home the top prize at this semester’s Vol Court Pitch Competition. Winter pitched the device, EasyWhip, to beat a record 23 competitors. Vol Court is hosted twice a year by the Anderson Center for Entrepreneurship and Innovation in UT’s Haslam College of Business. EasyWhip is designed to help improve the speed and consistency of certain orthopedic surgical procedures. Winter, from Pittsburgh, Pennsylvania, is both an MBA candidate in the Haslam College of Business and an MS candidate in the UT Institute for Biomedical Engineering. She won $1,500 along with a sponsored prize package, which included free office space in the UT Research Foundation Business Incubator, consulting services courtesy of PYA, legal advice from Morehous Legal Group, and design services from Innovative Design Inc.
Second-place winner Matthew Young pitched his technology-enabled mirror business, Smart Mirrors. Originally built as a gift for his father, Young’s product delivers information to users directly on the mirror’s surface. Young, a senior in finance from Chester Springs, Pennsylvania, won $1,000 and the sponsored prize package. Third place and $500 went to Quantum Lock, a technology that enhances the security of smart lock technology in private homes. Erica Grant of Richmond, Virginia, a PhD candidate in the UT–Oak Ridge National Laboratory Bredesen Center for Interdisciplinary Research and Graduate Education, founded the company. “Quantum Lock leapfrogs the current smart lock generation by using a property of quantum physics to block out any hacking and provide maximum protection to a home without sacrificing any of the convenience,” said Grant. 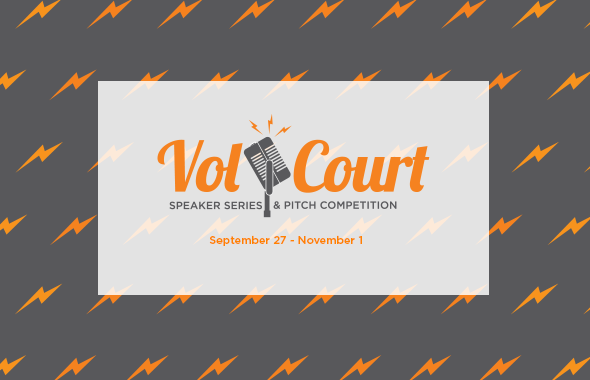 The Vol Court Pitch Competition was the final event of the fall 2017 Vol Court Speaker Series. Prior to the competition, participants attended five entrepreneurial lectures covering topics like customer discovery and legal structure for businesses. Vol Court is a free event hosted by the Anderson Center each fall and spring semester. It is open to UT students, faculty, and staff, as well as members of the local community. Sponsors for the fall competition included the UT Research Foundation, PYA, Morehous Legal Group, Three Roots Capital, Funding Sage, and Innovative Design Inc.
UT students, faculty, and staff as well as members of the local community, are encouraged to pitch their business ideas at Vol Court, a semiannual pitch competition and speaker series run by the Anderson Center for Entrepreneurship and Innovation in UT’s Haslam College of Business. The competition begins September 27. Winners may receive up to $1,500 in prize money and space in the UT Research Foundation Business Incubator as well as legal and accounting services. Vol Court kicks off on September 27 with a five-week interactive entrepreneurial speaker series. The fall series introduces new speakers, which includes local entrepreneurs and UT faculty. The program culminates on November 1 in a pitch competition where attendees put what they’ve learned into practice. All pitch competition participants are eligible for cash prizes awarded to first-, second-, and third-place winners. Vol Court meets from 5:15 to 6:15 p.m. every Wednesday from September 27 through November 1 in Stokely Management Center, 916 Volunteer Blvd. All meetings will be held in Room G4. Vol Court is made possible by donated funds and services from sponsors including PYA, Morehous Legal Group, Hard Knox Pizzeria, the IT Company, 3 Roots Capital, the UT Research Foundation, and other local businesses. 2017 Spring Vol Court Pitch Competition winners: Sushmitha Vijaya Kumar, Florin Matei, and Matthew Young. 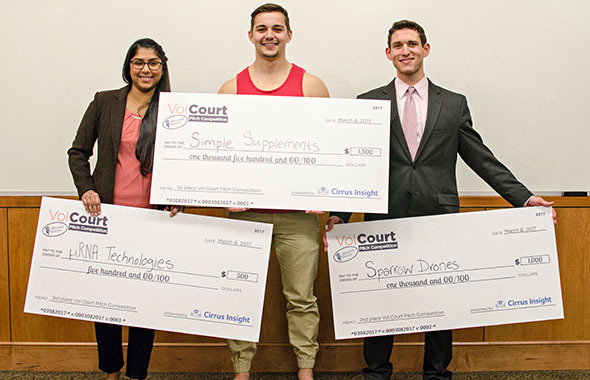 A simpler, less messy approach to protein supplements helped University of Tennessee, Knoxville, junior Florin Matei take home the top prize at this year’s Vol Court Pitch Competition. 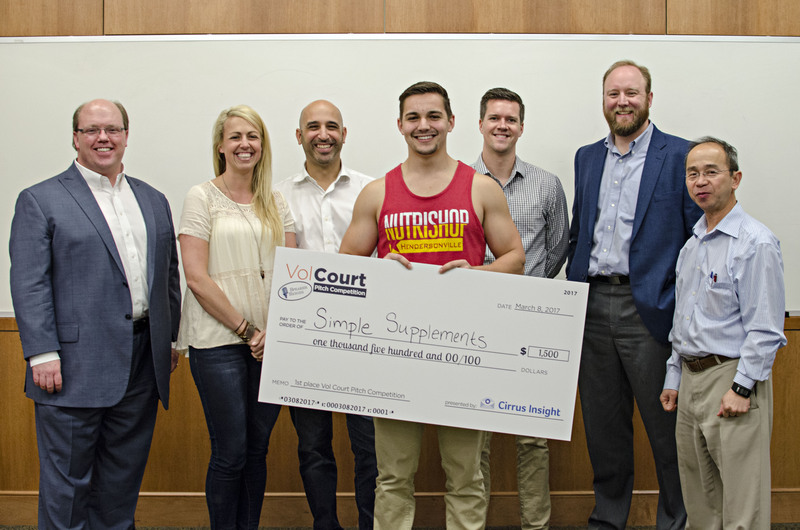 Simple Supplements, a startup founded by Matei, beat 18 competitors to take first place. Simple Supplements provides a protein powder product that requires no measuring or preparation by the consumer. The ready-to-use protein powder pods feature an edible casing, ready to mix with liquids. Matei, a management major from Gallatin, Tennessee, won $1,500 along with one year of free office space in the UT Research Foundation Business Incubator, consulting services courtesy of PYA, legal advice from Morehous Legal Group and a yearlong subscription to TurboFunder provided by Funding Sage. Second place went to Matthew Young’s Sparrow Drones, a rescue communications device aimed at strengthening the correspondence capabilities of EMTs, police, firefighters and other first responders. Young, a junior in finance from Chester Springs, Pennsylvania, won $1,000, six months of free office space in the UT Research Foundation Business Incubator, consulting services from PYA, legal advice from Morehous Legal Group and a yearlong subscription to TurboFunder provided by Funding Sage. Third place went to µRNA Technologies, a company developing diagnostic kits for simple, rapid detection of pathogens causing diseases. Sushmitha Vijaya Kumar, a Ph.D. candidate in the Graduate School of Genome Science and Technology from Knoxville, founded the company. She was awarded $500 and a yearlong subscription to TurboFunder provided by FundingSage. First place winner and Vol Court judges: David Morehous, Morehous Legal Group; Alexa Sponcia, Hard Knox Pizzeria; Paul Sponcia, The IT Company; Florin Matei, Simple Supplements; Aaron Riley, Cirrus Insight; Chris Miller, Three Roots Capital; Nghia Chiem, UT Research Foundation. 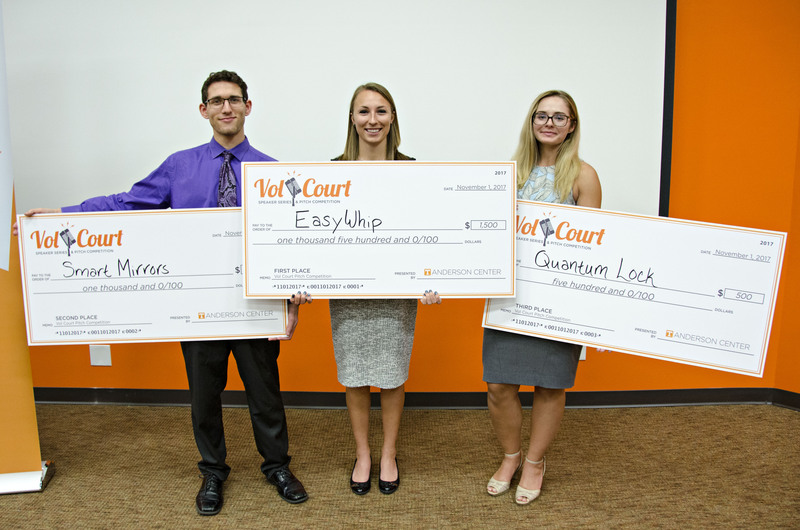 The Vol Court Pitch Competition was the final event of the spring 2017 Vol Court Speaker Series. Prior to the competition, teams attended five entrepreneurial lectures covering topics like opportunity identification and intellectual property. Prize money was donated by presenting sponsor Cirrus Insight and supporting sponsors Launch Tennessee and the IT Company. Vol Court is a free event hosted by the Anderson Center each fall and spring semester. It is open to UT students, faculty and staff, as well as members of the local community. Sponsors for the spring competition included Cirrus Insight, the UT Research Foundation, Launch Tennessee, PYA, Morehous Legal Group, the IT Company, Hard Knox Pizzeria, Three Roots Capital and Funding Sage. The Anderson Center for Entrepreneurship and Innovation invites students, faculty, staff and members of the local community to pitch their business ideas at Vol Court, a semiannual pitch competition and speaker series. Winners of the competition receive up to $1,500 in prize money, space in the UT Research Foundation Business Incubator, and legal and accounting services. Vol Court kicks off Feb. 1 with a five-week entrepreneurial speaker series. The event culminates March 8 in a pitch competition where attendees put what they’ve learned into practice. Local entrepreneurs and UT faculty will cover a range of business topics. As part of the series, Vol Court director Shawn Carson will share his own entrepreneurial expertise. Vol Court has grown in recent years to include more speakers, sponsors, participants and prizes. All pitch competition participants are eligible for cash prizes awarded to first-, second- and third-place winners. Vol Court meets 5:15 to 6:15 p.m. every Wednesday from Feb. 1 through March 8 in the Haslam Business Building, 1000 Volunteer Blvd. The Feb. 1 meeting will be held in Room 103, but all other sessions—as well as the pitch competition—will be held in Room 104. The speaker series and pitch competition are open to the public. There is no charge to participate in the event, and anyone interested in starting a company is encouraged to attend. 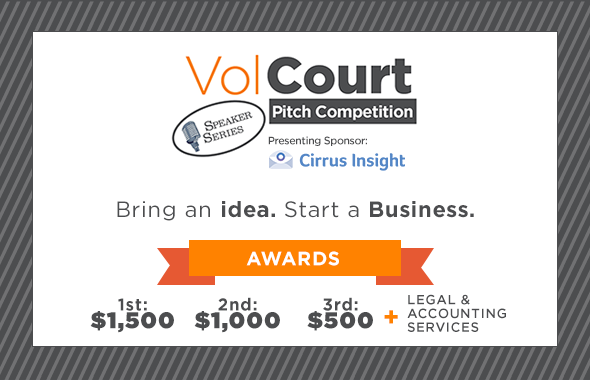 Vol Court is made possible by donated funds and services from sponsors, which include Cirrus Insight, PYA, Morehous Legal Group, Hard Knox Pizzeria, The IT Company, Funding Sage, 3 Roots Capital and the UT Research Foundation.